Everyone knows about the orange, tasty root of the carrot, but the frilly leaves and the white flower that blooms if this vegetable plant reaches maturity may be less familiar. A biennial plant that grows for two or three years before naturally dying, carrot (Daucus carota var. sativus) is native to Europe and western Asia. Emanating from the ground from a common point atop the root, the carrot's foliage is fern-like and fine in texture. Each leaf arises from a thin stem and is triangular in shape with hundreds of tiny leaflets, resembling a fern frond. These leaves are held upright in a tufted cluster. As a vegetable crop, Americans associate the carrot root with the color orange. In Europe and Asia, more ancient varieties of carrot produce roots with deeper red, purple or nearly black tones. The root's shape ranges from long and tapering to more stout and rounded. 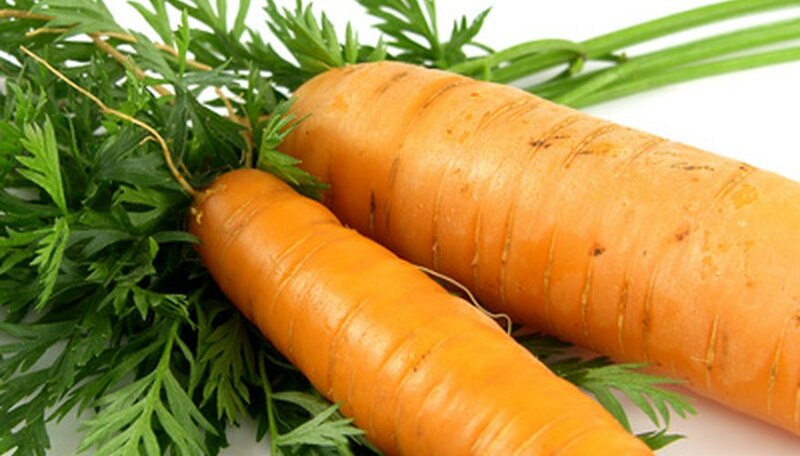 In soils that are moist and loose, carrot roots elongate more so than in heavy dense soils. Depending on variety, the length of mature carrot roots may be as short as 2 inches or as long as 3 feet. Parts of the root top exposed to sunlight above ground blush green. If left in the ground for a second growing season, the carrot plant blooms. In late spring or early summer, a tall flower stem reaches about 1 foot above the top of the leaves and bears a flatten cluster of white flowers, called an umbel. The flowers resemble flat-topped umbrellas, serving as a nectar source and a landing pad for bees and butterflies. Seeds form after pollination and drop to the ground and germinate the next growing season. Modern varieties of carrot often fail to yield seeds because the blossoms may lack the male flower parts needed to facilitate pollination.